My final treat for Choctoberfest are these Chocolate Glazed Eclairs. 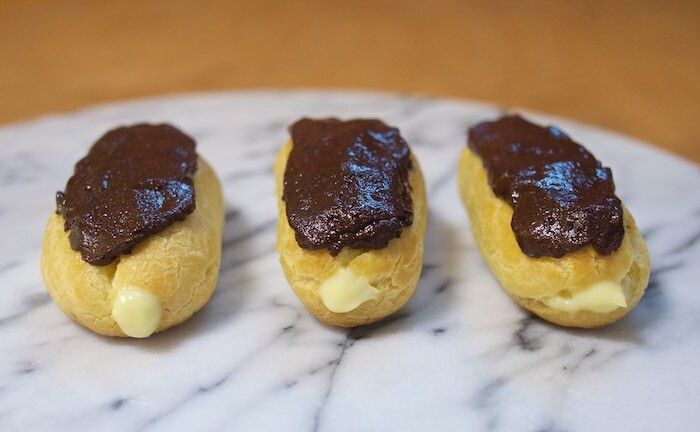 Family and friends adored this delicious combination of choux pastry filled with cream and topped with dark chocolate. Let's just say there weren't any leftover! Special thanks to Rodelle Chocolate & Imperial Sugar for sponsoring this particular post. For those that have not heard about Rodelle cocoa, it is a Dutch processed cocoa which provides a much more consistent product and flavor than natural cocoa. Baked goods come out decadent and rich when Rodelle chocolate is used. Heat the oven to 425°. Bring milk, butter, salt, and 1⁄2 cup water to a boil in a 4-qt. saucepan over high heat. Add flour; stir until a dough forms. Reduce the heat to medium and cook, stirring, the dough constantly with a wooden spoon, until slightly dried, about 2 minutes. Transfer the dough to a bowl and, using a hand mixer, beat in eggs, one at a time, until smooth. Using a piping bag, pipe 4-inch lines of dough onto parchment paper-lined baking sheets. Place the tray in the oven and reduce the temperature to 375°. Bake until golden brown, about 30 minutes, and cool. In a medium-sized heatproof bowl, mix the sugar, vanilla and egg yolks together. Sift the flour and cornstarch together and then add to the egg mixture, mixing until you get a smooth paste. Then pour the entire mixture into a medium saucepan and cook over medium heat until boiling, whisking constantly. When it boils, whisk mixture constantly for another 30 - 60 seconds until it becomes thick. Remove from heat. Pour into a clean bowl and immediately cover the surface with plastic wrap to prevent a crust from forming. Cool to room temperature. If not using right away refrigerate until needed, up to 3 days. Whisk or stir before using to get rid of any lumps that may have formed. Make a wide incision in the side of each pastry. Place pastry cream into a piping bag and fill each pastry with cream. Spread chocolate over the top of each. Let sit for about 5-10 minutes, until the chocolate hardens, before serving. I have always wanted to make eclairs and these looks amazing! And thanks for linking up at Friday Frenzy Link Party! I hope you link up again next week :) PINNED!